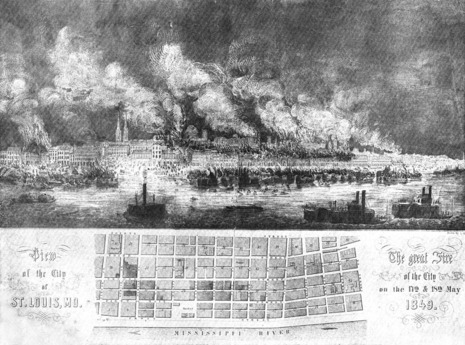 The St. Louis Fire of 1849 was a devastating fire that occurred on May 17, 1849 and destroyed a significant part of St. Louis, Missouri and many of the steamboats using the Mississippi River and Missouri River. This was the first fire in United States history in which it is known that a firefighter was killed in the line of duty. Captain Thomas B. Targee was killed while trying to blast a fire break. The installation of a complex system of sewers was, perhaps, made simpler when, in the spring of 1849, the steamship White Cloud made its way up the muddy waters of the Mississippi (few suspecting the steamer would bring its own namesake's antithesis) and docked in St. Louis. While in port, a fire broke out on the Cloud and severed the unfortunate ship's moorings. As the blazing White Cloud drifted upon the Mississippi's current, it set 22 of its fellow craft aflame. The fire soon spread ashore, setting the timbered town alight and sending clouds of black smoke hurtling into the night sky. The volunteer fire department tried its best, but eight hours into the heated battle it seemed the entire town was going to burn. A daring decision was made to detonate kegs of black-powder in several businesses, destroying them and creating a block-wide barrier against the seemingly insatiable inferno. The plan worked and the rest of St. Louis was saved. City ordinances passed after the fire required the riverside to be rebuilt in brick and stone to help prevent a similar disaster from occurring again. Many residents, fearful of a repeat of that disastrous year, began to relocate to the western outskirts of the city, establishing in the process many of the decentralized neighborhoods common to modern St. Louis. 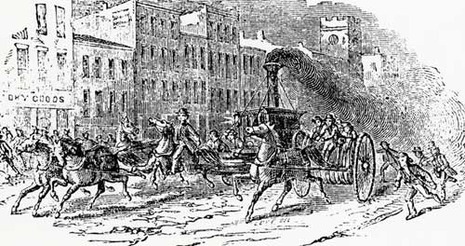 St. Louis was ill prepared for the events of the evening of May 17, 1849, when a fire started on the steamboat White Cloud. The boat was moored at the foot of Cherry Street, later renamed Dr. Martin Luther King Avenue and located to the north of where the Gateway Arch stands today. No one knows how the fire began. An 1850 investigation into the fire claimed that sparks from the smokestacks of a passing riverboat lodged "on a newly painted boat and [were] favored by a high wind blowing on them." At the time of the fire the St. Louis Volunteer Fire Department had just nine companies and about 1,000 members. Equipment consisted of hand-operated pumps and ladders on hand-drawn carts and horse-drawn wagons. Bells clanged a warning on the moored steamboats as the fire was fanned by strong winds blowing from the northeast down the Mississippi River. It spread to the boat Eudora, moored upstream from the White Cloud, which quickly burst into flames and sank. The Edward Bates, moored to the south, also caught fire, and its hawser was burned through. The burning boat began to drift downstream, spreading flames from boat to boat as it bounced down the length of the levee.